I teamed the new In-Color “Lemon-Lime” with Early Espresso … it is so bold and fun, the flower look was perfect for this combination. 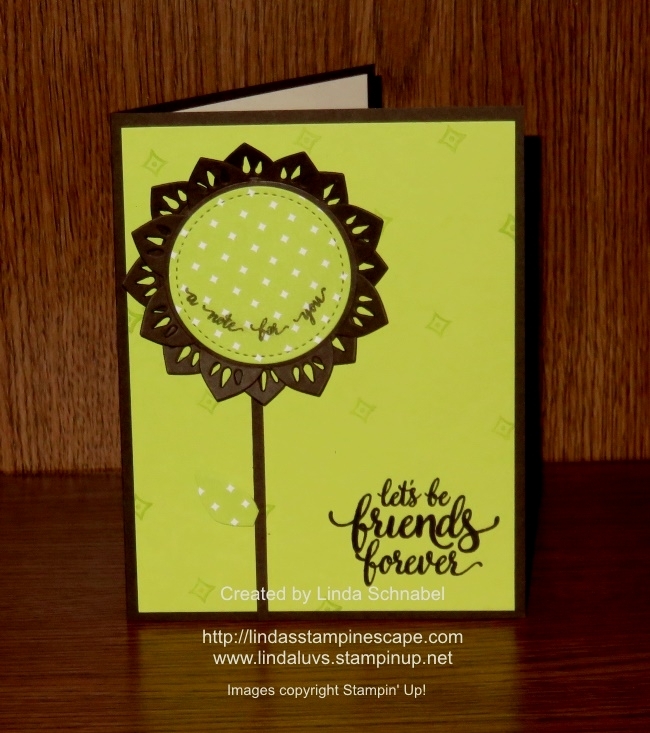 The background was stamped to give it a little dimension and I thought the design matched the little designs in the Designer Series paper. The little leaf was cut from a piece of scrap left from cutting out the flower center. I used the Stitched framelits dies for the center. We have less than one week to purchase the “Eastern Palace Bundle” … but this is some of the most fun I’ve had with a stamp set in a long time! You can click on either of the bundles above to view the contents of each bundle. I love that you will get 3 of the 5 new In-colors!! Oh yes, and the free stuff. Please let me know if you have any questions on this product suite, or the bundles. Don’t forget … we also have less than a week to take advantage of the retiring items (some up to 50% off) Once they are gone, they are gone, so don’t miss out. Contact me with any questions. Hope you have wonderful plans with friends and family this holiday weekend, and take a moment to remember those who have paid the ultimate price in the fight to keep our country free. Below you will find links to all the RETIRING PRODUCTS … just click on the picture. Linda…If Im looking at this correctly, the only way that I can get the thinlits is to either buy them separately or to buy the bigger package. Is that correct? Hi Meg, To get the thinlits on this promotion which includes the free items, yes …you would have to purchase the larger bundle. Otherwise you can wait until the new catalog goes live and purchase them then. Currently you cannot purchase anything separately.